BERLIN (Bloomberg) -- Volkswagen said nine-month profit jumped more than sixfold, beating analysts' estimates. The company also forecast that growth in the current quarter will slow. Net income was 4 billion euros ($5.6 billion), compared with 655 million euros a year earlier, VW said Friday. Analysts predicted profit of 2.8 billion euros, the average of four estimates compiled by Bloomberg. Sales gained 20 percent to 92.5 billion euros. VW didn't break out third-quarter figures. VW, whose profit is driven by the Audi luxury unit and emerging markets such as China, said the pace of growth in the first nine months won't continue “as strongly” in the fourth quarter. Nine-month sales at VW's seven passenger-car brands, including Audi and Czech unit Skoda, rose 13 percent to a record 5.37 million vehicles. The numbers don't include deliveries at Porsche SE, the sports-car manufacturer that is merging with VW. China, western Europe, North and South America will “continue to drive demand” as VW presents new models such as the Audi A7 coupe, the VW Passat station wagon or Bentley's new Continental GT coupe, VW said. VW aims to reach its sales goal of 10 million vehicles by 2015, three years earlier than planned, as VW tries to pass Toyota Motor Corp. as the largest automaker, a person with direct knowledge of the matter said this week. More than 8 million deliveries are targeted by 2012, said the person, who asked not to be identified discussing internal goals. Nine-month operating profit more than tripled to 4.8 billion euros from 1.5 billion euros a year earlier, VW said. The carmaker is targeting a second consecutive year of record global sales as it adds about 70 models, including upgraded versions of existing vehicles, across its brands. VW sold 6.29 million cars, sport-utility vehicles and light commercial vans in 2009, a gain of 1.1 percent. 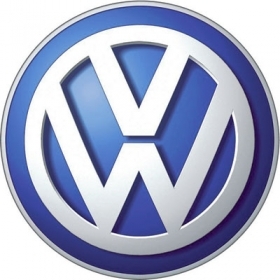 VW increased nine-month sales of all brands in China by 39 percent to 1.48 million vehicles. Audi, already the largest luxury-car maker in the country, boosted deliveries 61 percent to 174,907. The German company will add two factories in China as part of a 6 billion-euro plan to double production there to 3 million cars within four years. VW will also open a plant in Chattanooga, Tennessee, next year to supply the U.S. market and is expanding capacity in Russia. VW will release more detailed results on Oct. 27.